By the way, this won't work unless you've already uploaded at least one file to your Cloud Drive using conventional means (i.e. Amazon's Web interface). Also, if you want to do any heavy-duty file syncing, plan on investing in the $50 Pro version of Gladinet. (I think most users will be able to get by just fine with the free version.) The software is available in 32-bit and 64-bit versions for Windows XP, Vista, and 7. Taking a vacation? Planning to be away from your computer for more than a day or two? If you're a Gmail user, there's an easy way to make sure that friends, family members, co-workers, and others get an answer to their e-mails--even when you're traveling. It's called a "vacation responder," and it sends an automated reply to anyone who e-mails you during a designated time. It takes all of 60 seconds to set up, and it can even terminate automatically upon your return. Go to Gmail Help to learn how. Internet Explorer, even in its latest release, doesn't do bad spellers any favors. 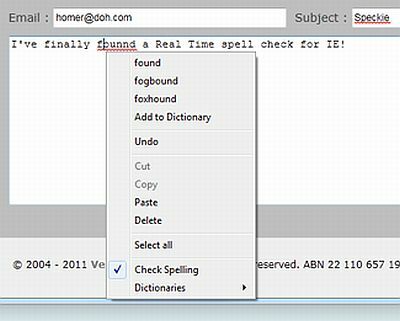 Thankfully, there's Speckie, a free Internet Explorer add-on that provides real-time spell checking. After installing Speckie--which, incidentally, is compatible with all versions of Windows and all versions of Internet Explorer (including 9)--it immediately starts working, underlining any misspelled word with a squiggly red line. To see suggested correct spellings, just right-click the word. If English isn't your primary language, you'll be glad to know that Speckie comes with a whopping 24 dictionaries, with languages ranging from Croation to Vietnamese. Bottom line: if you're an Internet Explorer user who needs a spell-checker for e-mail, Web forms, and other browser-based activities, Speckie gets the job done quickly and efficiently.